Larissa Explains It All...: 500 Posts and a Giveaway! 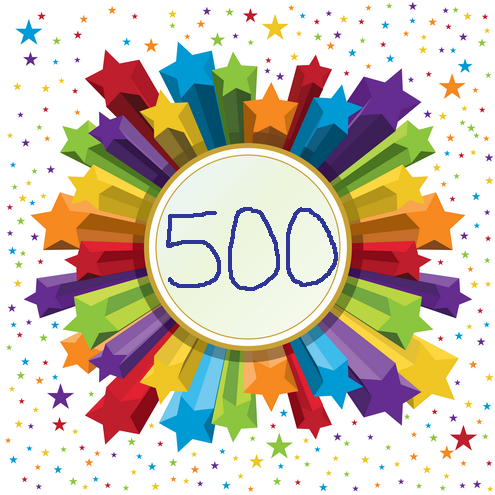 This is officially my 500th blog post! How does one celebrate an accomplishment such as this? A giveaway, naturally. My very first - be excited! All you need to do is comment on how blogging, or reading a fantastic blog such as mine, has changed your life. I'll randomly select a winner on February 22. The prize? A $20 Amazon.com gift card. This is one of my favorite sites and can be used by anyone all the world over. Please follow my blog because on this, my 500th post, I am making a goal to reach 50 followers. In my vocabulary, the phrase, "I blogged about it, " has become synonymous with, "I thought about it." I have effectively stopped writing in my journal. I used to print blog entries and e-mails to tape into my journal, but you really can't beat a publicly accessible written personal history. I contemplate my opinions more thoroughly and develop more of them. I have built-in conversation pieces with most of my friends while we discuss one of our latest entries. My personal communications have suffered because when friends I haven't spoken with in awhile ask me what has been going on in my life, I refer them to my blog. Oops. I've developed stronger friendships with my readers. As they read my opinions on things that never would have just randomly come up in conversation, we realize we have more in common in thought and deed than we ever could have known. And we bond. Precious. I have a built-in therapist. Through writing things out, I've been able to express myself and often times come to startling realization about things I am struggling with. And I've been able to share my celebrations! I have realized people do care what I have to say. I have a creative outlet. How has blogging/reading a fantastic blog influenced your life? I don't blog at all. I love to read the blogs of those that have gotten into it. It helps me to keep up with those I love, but don't get to see as often as I would like. I love the idea that you use your blog as your journal. Reading your blog has lead me to other blogs that I can't WAIT for new posts to come out, such as Mis-Adventures in Dating. I have found that I really enjoy reading about the interesting things people think about or do, and funny things that happen to them. It makes me wonder if anyone would be interested in my OWN stories. I honestly look forward daily to reading blogs. When I open my Google Reader and no one has posted anything I get sad. It is a short escape for me daily to visit someone else's blog. I get to laugh and cry with my friends vicariously through their blogs. Plus in your case, it is nice to have someone explain it all! I canNOT believe I wasn't a follower of your blog. I read every single post. I have corrected myself, and now you can officially call me your follower-friend. Larissa, I love your blog! Your thoughts and insights into dating/exercising/life in general resonate with mine and enrich my own understanding of those things. I have my own blog that update every few months or so. Your steady and continuous posting continally reminds me that other people are probably interested in the things I have to say, and it keeps me thinking about the things I need to post on my own neglected blog. Thank you for your inspiration, your friendship, and your love. You're a doll! I follow your blog because it's fun to remember the magic of a theater experience, and keep track of a dear friend!I'm getting better at blogging. It took awhile for me to make friends with the concept because I couldn't imagine anyone reading my blog. But, it seems my kids do, and that's good enough for me. I go in spurts, sometimes holding out because I don't have a picture--although, if I know I'm going to blog about something I'm more likely to keep my camera handy. Sometimes I just come across a great quote that I want to float out there. It has become a bit of a journal for me--it certainly is a place to organize thoughts from time to time. As someone who has been blogging for a very long time, I find that my blog has been many things over the years. It's a record of some of what I'm going through (though I'm probably not as open as you are on yours), random chuckle-inducing thoughts, and a place where my friends can find pictures and updates on my travels and some of my other adventures. I'm not a mormon mommy blog reader. I like reading single mormon blogs and the humorous things that happen in their lives and how they are leaving their mark on the world. Yours is one of those marks. Thanks. You my dear are just too good. ha ha I love that you are doing a give away for your 500th post. All I can say about your blog, your certainly bring funny things to my attention that I had never thought about before. I love your Wit and wisdom. Makes me wish i was a good writer and had funny experiences like you do. I get inspired when I read a really good blog. Mostly in the decor department actually. I love design blogs that help push me to do what I love. Blogging has given me a new forum in which to post things I'm upset about. Also, it's given me new subjects to be upset about - mainly how stupid the word "blogging" is. Also, my word for verification for this comment is "pents," which just looks bad. I think my writing ability is probably my greatest talent, and I love showing it off. When someone comments on a blog post you wrote, it either means you wrote something interesting enough that they had to respond, or they just really really care about you, or maybe both (or they're doing a giveaway :-)). It's a great feeling. I don't know if it has changed my life drastically. It's probably made it easier to keep up with friends who otherwise might have drifted more into the acquaintance category. Blogging is an outlet for me to write about the inner workings of my heart and mind while still keeping enough of a filter to not incriminate specific individuals. I love to write and blogging has helped me explore that talent while also sharing my adventures, experiences, life lessons, and testimony with the unknown blogging world. And when I read blogs, I feel like that world gets a little smaller and I bond with the writer - whether I know them personally or not. However, if I know them, I much prefer a real-life conversation. This is just another outlet, not a substitue for actual interpersonal communication. OK on a serious note now...I love to read the blogs that several others have left but also the responses that it elicits. Many a time I have been reading a blog that put another point into view, I am one that truly appreciates the meaning behind ones thought process, I may not agree with it, but I enjoy the other side of views. And too many times, when it is a view that I am in total agreement with, I find myself smiling and nodding as I read "my thoughts". But why do I enjoy this blog in particular..because you do open many aspects of your life that many keep, as you say, in their "journal". you are concise, honest, witty and you never take it too seriously. Blogging has helped me to find my unique "voice" and pinpoint who I am versus what I do in the professional world. I write differently on my blog than I do in business writing, technical writing, story writing, or in my journal. I love it when people tell me that my blog sounds the way I speak. And I find myself thinking in terms of whether I should blog about an experience or thought or put it in my private journal... and this means that I get to determine just how many any reader gets to know about me. I love getting feedback from others on what I say, and I'm always fascinated by which posts get comments. For some reason, they're never the ones I expect! Reading blogs has given me a chance to know people on a deeper level (like you said, because they blog about things that might not come up in conversation), and also realize that I will never know everything. All I know is I am always thrilled when a friend posts! I'm writing in behalf of Kevin. He is a follower at heart. Reading your blog has changed his life because now he knows one of his wife's best friends a little better. You're pretty stellar, doll! And this blog has made him a celebrity. This is his formal entry to win the prize. Helps me to understand others better and read new thoughts & ideas. I am officially your 50th follower. PRAISE ME! Why do I blog? I feel like it's been a good way to share my ideas and life with the world. I love when a person tells me "hey I tried that recipe you posted and it was so good." I try to avoid the whole "mormon mommy blog" feel because it's about me and my husband, not just me. How has it changed my life? Not too significantly, but it's helped me see how I can reach other people in a small way. I will never care too much that I don't have a ton of followers, because I know that people still read my blog. Also, it's helped me see how blessed I am to have such a wonderful life, wonderful husband, wonderful friends. Happy to be following you now, Riss. Best of luck on your next 500. I talk a lot. Don't know if you have ever noticed. I love conversation. Naturally I love conversing in all forms. Congratulations! I miss your face!! Blogging is an interesting way to find out things about friends and family who you don't get to talk to on a regular basis. Even though it is more of a one way conversation... since I don't blog, it still allows me to learn things about my friends and family as well as learn from them. Sometimes I'm sure they don't realize they're sharing knowledge and insights with me. Reading blogs has opened up a wide variety of perspectives that I otherwise wouldn't get to hear, as well as giving me access to lots of free creative ideas, projects and tips! As a result, I'm better able to keep in touch with things that I find interesting or important than back in the dark times when we only had regular access to mainstream media outlets. "My personal communications have suffered because when friends I haven't spoken with in awhile ask me what has been going on in my life, I refer them to my blog. Oops." When people ask me what's going on in my life and don't know that I've posted everything of possible interest, I try to check my irritation. If they ask me a question that I DEFINITELY just blogged about, I try to not be annoyed with them. I know not everyone is a blog-addict like me, but... really? If you're my true friend, you should read my blog. Haha... just kidding. Sort of.